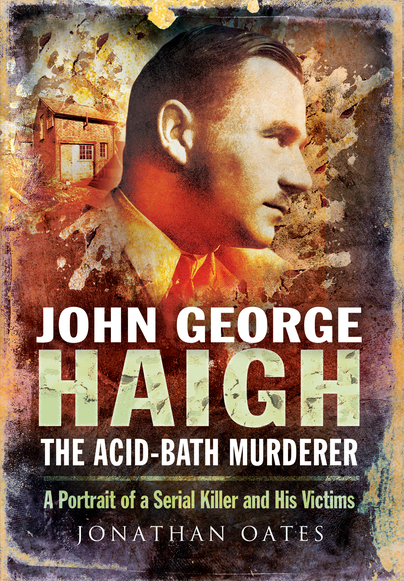 You'll be £12.99 closer to your next £10.00 credit when you purchase John George Haigh, the Acid-Bath Murderer. What's this? What motivated John George Haigh to murder at least six people, then dissolve their corpses in concentrated sulphuric acid? How did this intelligent, well-educated man from a loving, strongly religious family of Plymouth Brethren become a fraudster, a thief, then a serial killer? In the latest of his best-selling studies of criminal history, Jonathan Oates reinvestigates this sensational case of the late 1940s. He delves into Haigh's Yorkshire background, his reputation as a loner, a bully and a forger during his years at Wakefield Grammar School, and his growing appetite for the good life which his modest employment in insurance and advertising could not sustain. Then came his move to London and a rapid, apparently remorseless descent into the depths of crime, from deceit and theft to cold-blooded killing. As he follows the course of Haigh's crimes in graphic, forensic detail, Jonathan Oates gives a fascinating inside view of Haigh's attempt to carry through a series of perfect murders. For Haigh intended not only cut off his victims' lives but, by destroying their bodies with acid, literally to remove all traces that they had ever existed. What Dr Jonathan Oates manages to accomplish with this book is remove the tabloid style “glamour” from the narrative and instead presents an academic yet nonetheless riveting account, appraisal and conceptually fascinating account of the events and those embroiled in them... For any analyst of the criminal mind, John George Haigh: The Acid Bath Murderer is a worthy addition to any collection. In his book, Jonathan Oates has presented a well-researched, detailed and exciting piece of writing using original documents and testimony to examine a case as intriguing as it is horrifying. Jonathan Oates takes you on a journey through the childhood of John George Haigh, leading you into his life of crime and through each of his murders. The victims of John George Haigh are given the attention they deserve, exploring their histories and giving a true picture of who they were before their lives were taken. Haigh's arrest, his trial, conviction and eventual execution are dealt with chapter by chapter, allowing you to discover the full story from beginning to end. With a writing style that is easy to understand yet detailed, Jonathan Oates writes with realism not theory and opinion. He gives descriptive accounts of the case with an analytical slant presenting quotes and anecdotes from those who knew John George Haigh at different stages of his life. .. This is not a sensationalist book, reproducing the details of a gruesome case thrown together for a sale. This is a well-researched and well-structured informative book into the life, crimes and victims of John George Haigh. If you are looking for a detailed, accurate and in-depth look at John George Haigh and his crimes, following through to his capture, trial and execution, this is the book for you. In the latest best-selling studies of criminal history, Jonathan Oates, reinvestigates this sensational case of the late 1940's. He delves into Haigh's Yorkshire background, his reputation as a loner, a bully and forger during his years at Wakefield Grammar School, and his growing appetite for the good life which his modest employment in insurance and advertising could not sustain. As he follows the course of Haigh's crimes in graphic, forensic detail, Jonathan Oates gives a fascinating inside view of Haigh's attempt to carry through a series of perfect murders. There have been a number of books published about Haigh and his murders but this one is more accurate and detailed as the author went back to primary source material. There is a considerable detail about Haigh and his criminal history building up to the murders. Much of the detail of the murders comes from Haigh's confessions though there was a deal of forensic and scientific evidence gathered by some of the most famous forensic specialists of the day. The book also has a section considering the mental state of Haigh. This is a revealing and obviously well researched book that is of interest in particular to former and serving police officers who will recognise some of their former 'clients' the difference with Haigh being he murdered, was caught and executed. Dr Jonathan Oates has written a number of books on murder, and has produced an in-depth study of Haigh from his early childhood. Well researched, it is a thoroughly readable book. This is the first book on the topic to be written with the benefit of police, prison and Home Office papers once closed to researchers. As seen in the 'Keighley News'. Oates' book is an attempt to get inside the mind of this complex character. You'll have to decide for yourself whether he succeeds or not, but he certainly manages to present some fresh insights into the well-trodden ground. As seen in the Telegraph and Argus. ...reveals fresh research and previously unpublished photographs of the infamous acid-bath murderer. Dr Oates, who is also Ealing Borough Archivist and local history librarian, was granted access to New Scotland Yard's archive, where he uncovered the never-before-seen photograph of a 32-year-old Haigh. As seen in the Ealing Times. As featured on BBC Radio London.